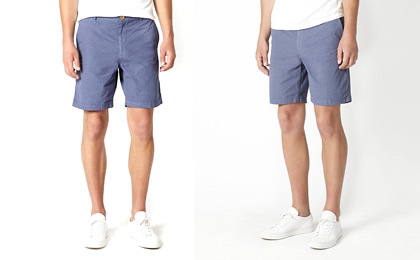 Your shorts for the summer. Come and get ‘em. Because no man should spend summer in jeans — or the androgynous no-man’s land of jorts — here are the three pairs of shorts you should cop right now. Made in Guatemala from handwoven fabrics, the colorful shorts of Jed & Marne are an easy summer staple. Head-turning patterns. Incredibly comfortable. And they look good on and off the beach. Available at Penelope’s, 1913 W. Division Ave.
For the man who needs a casual short for his days off, these classic five-pocket Relaxed Fit Shorts by Steven Alan will give you just enough room to kick around. Perfect for street fests and weekend brunches. Available at Steven Alan, 1659 N. Damen Ave.
Tough, hard-wearing and a tailored fit. That’s the Mash Short from 8.15 August Fifteenth. Available in olive or blue, they’re cut from herringbone twill and reinforced with some heavy-duty stitch work. These babies will last for miles. Available at Independence, 47 E. Oak St.